Discussion in 'Football Forum' started by United_We_Stand, Mar 18, 2018. 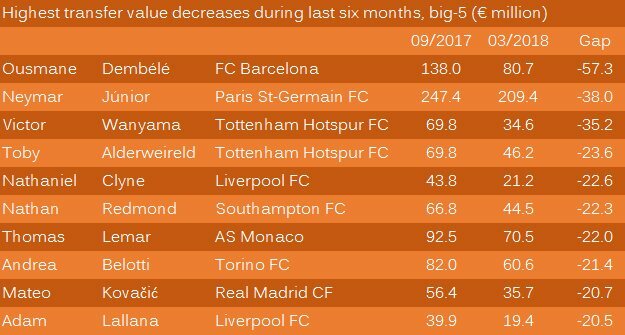 Mohammed Salah and City players top the list of biggest transfer value increases during the last six months. While Neymar has seen his transfer value drop by €38m over the past six months. For a second I thought this was ordered in terms of value and I got very confused at Lingard being our most valuable player. CIES valuations are a load of nonsense. It has Leon Bailey at €27.6m. I thought he was supposed to be a top young talent. He is. Laughable putting him alongside Solanke who plays nowhere near as much. Apparently they take the player's passport/NT and club into consideration. No way Salah was worth 88m in September 2017. More likely half that amount (i.e. what Liverpool paid). Aguero at 100m and Lukaku at 160m are stupid evaluations. Aguero is turning 30 in several months, no club would pay so much for him. Lukaku is only 25 but he isn't that good really even though he is doing well. In a pub somewhere in England Mike Ashley’s just spat his pint out all over his Sunday dinner.